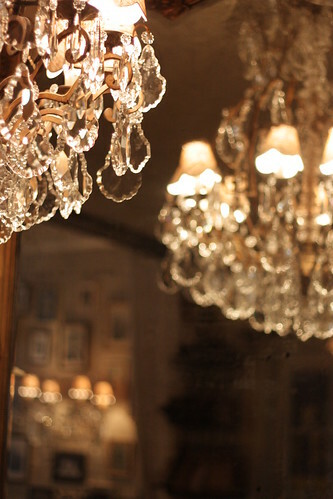 One of my favourite restaurants is my local tapas place, El Parador. They have a fantastic and extensive menu of the tastiest tapas I’ve ever eaten, better than anything I ate in Spain to be honest! Despite the length of the menu everything comes out of the kitchen tasting incredibly fresh. I tend to pick a different vegetable dish every time I go, along with my favourite seafood dishes, perhaps something from the specials menu and a plate of padron peppers. I’m never disappointed. On my last visit I came away with their cookbook, Tapas, by owners Carlos Horrillo and Patrick Morcas. 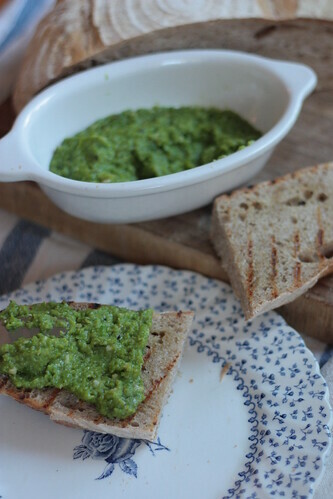 I decided I would make one of my favourite starters from the restaurant, Puré de Habas Verdes, or puréed broad beans with pan-fried garlic, rosemary and olive oil. 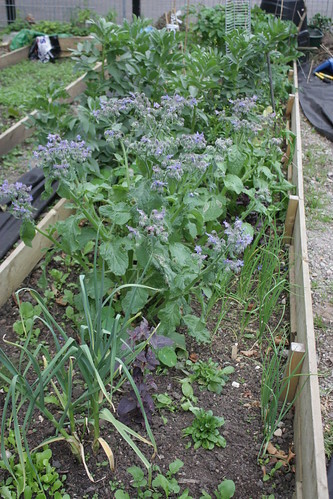 The recipe calls for garlic, broad beans, and rosemary, and as luck would have it I am growing all three on my plot. 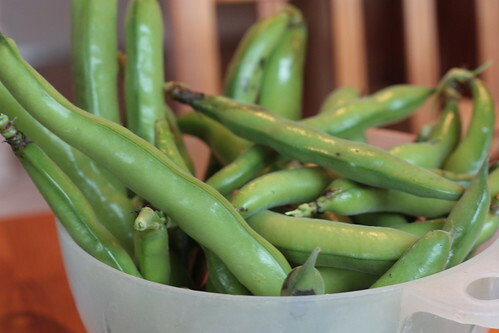 The broad beans were ripe for picking – a little late this year but they made it eventually! I let my plants grow tall, to well over a metre, and didn’t pinch the tops out. Occasionally a few blackfly would appear on the tops and then the ladybird army would move in and take them out (in fact, see my blog header picture for illustration). 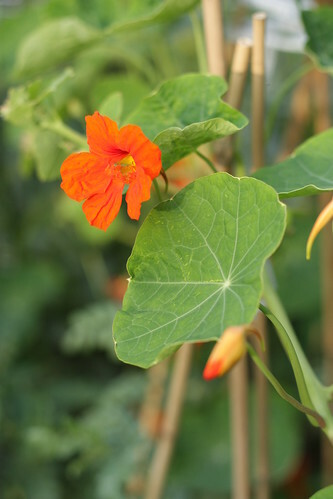 I companion planted nasturtiums as they are meant to distract blackfly from the broad beans (and also for their tasty leaves and flowers), but perhaps the ladybirds are super efficient as the aphids have left the nasturtiums alone. The rosemary used to live on my balcony, but it was taking over so it was the first thing I planted on my plot way back in March. I feel slightly guilty as it used to flower for several months of the year on the balcony and provide a favourite food for any intrepid bees managing to make their way up to the fifth floor. 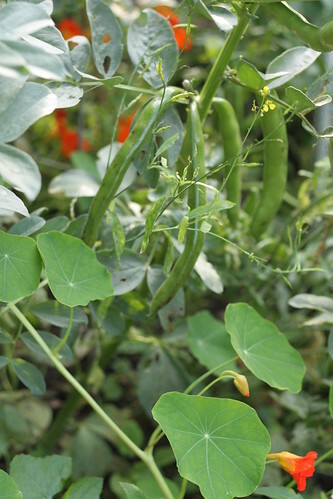 It is thriving on the plot though. My garlic is about to flower so I decided to leave it in the ground and use some I had in the kitchen instead. 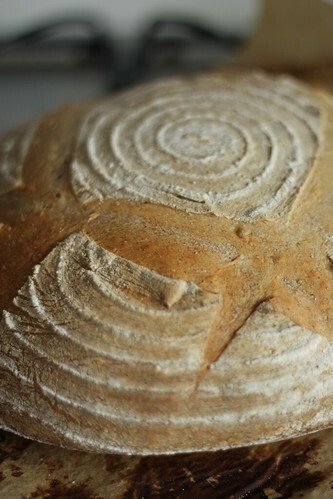 Made with British organic flour (decanted into containers but it was probably from Dove’s or Bacheldre). I really don’t think it gets much more local than that! 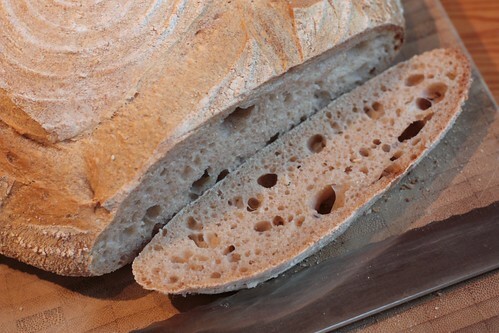 Recipe from my local restaurant, home-grown ingredients, home-made bread. The folks at El Parador have kindly given me permission to share the recipe. Heat 4 tablespoons of olive oil in a large, heavy-based frying pan on a medium heat. Peel the garlic cloves and crush them with the flat side of a broad blade knife or the bottom of a tablespoon. Add them to the pan with a pinch of salt and pepper and stir them around in the hot oil. Turn the heat right down and sauté very gently for 15-20 minutes, or until soft and pale golden brown. 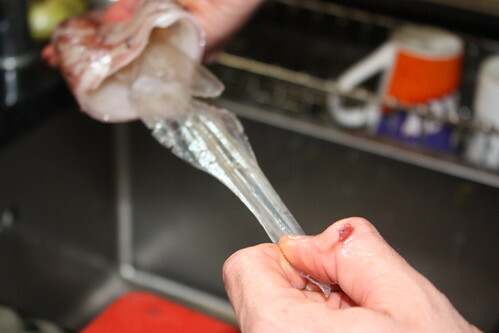 Remove with a slotted spoon and place in a dish to one side. Return the pan to a low heat, drop in the sprigs of rosemary and season with a further pinch of salt and pepper. 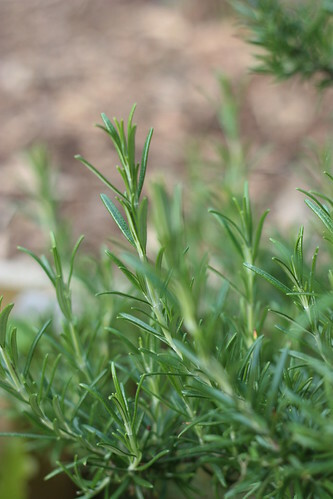 Stir the rosemary around in the pan and fry gently until the leaves begin to change colour – about 5-7 minutes. Remove with a slotted spoon and place in the dish with the garlic. Take the pan off the heat and allow the infused oil to cool down. 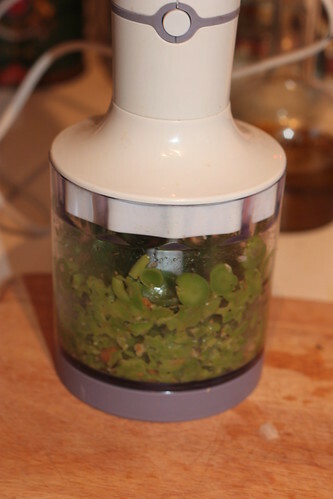 When the oil is lukewarm, pour it into your food processor and drop in the garlic, rosemary, and broad beans. Set the processor off at a slow speed and blend to a thick, smooth paste. If it is too thick, add a bit more olive oil. Season to taste. Once done, spoon into a serving bowl and serve immediately, or heat up in a low oven and serve lukewarm. It tasted just like it does in the restaurant – result! 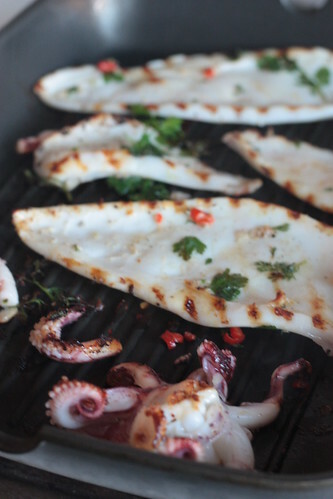 I followed that up with another recipe from the book, Calamares Adobados a la Plancha (Chargrilled squid with garlic, chilli and coriander), make with British squid and balcony coriander. Also delicious. I can really recommend going to El Parador if you are in London, and buying the cookbook whether you live here or not! The authors have a really friendly style of writing with lots of helpful tips. I’m sure I will get a lot of use out of my copy even though I can go to the restaurant any time I like. 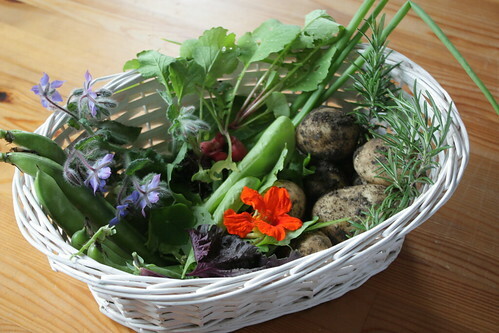 As we all know, the weather’s been dreadful, but I’ve been slowly harvesting a few things from my little plot. 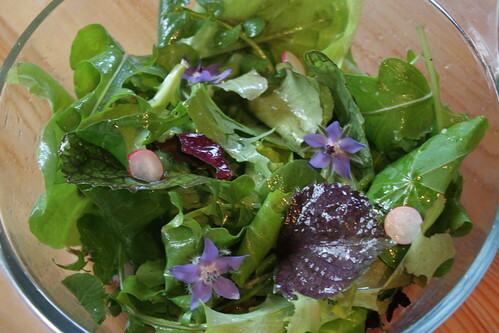 While my herbs have all rotted in the ground and my tomatoes are only just flowering, I’ve been harvesting a lot of baby salad leaves. There are also a lot of baby nettle leaves in my salad bed, so I’m harvesting with care! Current state of the plot. The borage got so big I had to pull one plant out. There’s still enough left for the bees, who are my constant visitors on the plot. Still trying to convince other plotholders that bees are good, especially if they want tomatoes this year. 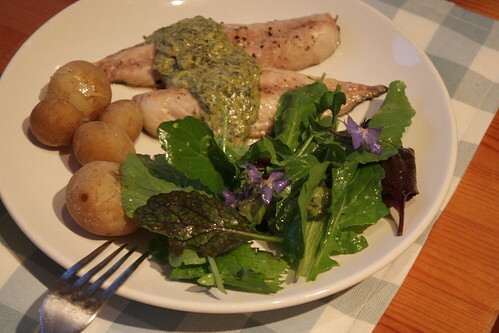 Mackerel with sorrel sauce, new potatoes and baby leaf salad. A basket of produce I put together very quickly to go on show at a local Family Fun Day. My spring onions were finally ready for picking around midsummer. I swear they had more flavour than supermarket spring onions. 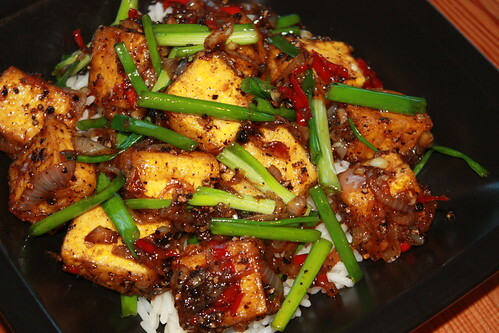 Here they are on top of some black pepper tofu. 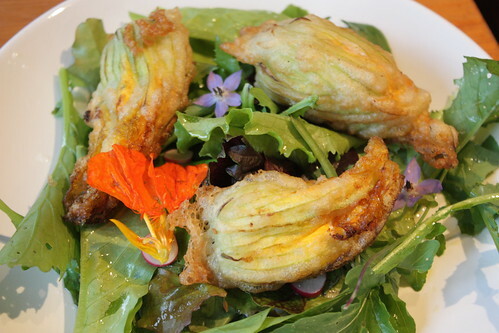 Courgette flowers, stuffed with ricotta, basil and mint and served on more home grown salad. Salad is one thing I’ve got a lot of. The snails and slugs seem to be leaving it alone, thank goodness. I’m growing so many different leaves – red mustard, green mustard, mizuna, rocket, cos lettuce, red lettuce, lamb’s lettuce, land cress, orache, perilla, and then there’s nasturtium leaves and flowers, and borage flowers (they taste like cucumber), and some tiny radishes (I gave up on them getting any bigger before going woody). 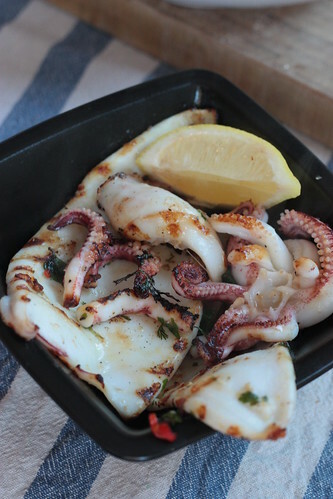 Dressed simply with good olive oil, lemon juice and salt. I love London. I also love gin. So it stands to reason that I was probably going to love the London Gin Club. The London Gin Club is based at the Star at Night on Great Chapel Street in Soho. I was invited to their press night a couple of weeks ago, where we got very merry sampling eight different gins, served in a balloon glass with Fever Tree tonic. 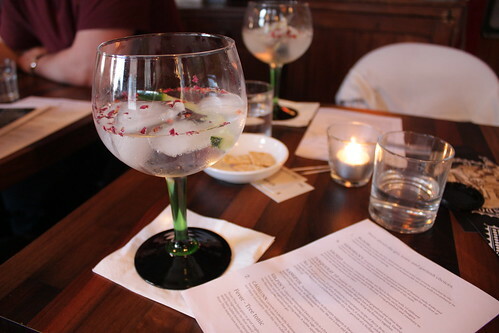 There are over forty gins on the gin and tonic menu, and I really like that they’ve matched each of the gins with a different garnish, informed by the botanicals in the gin. 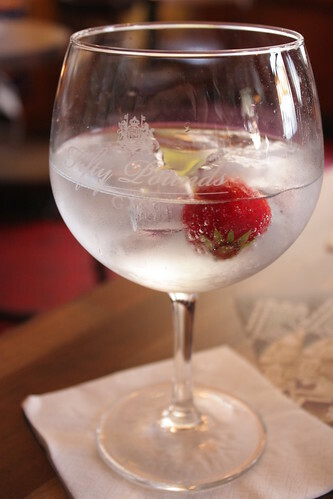 Bloom gin was garnished with strawberry. 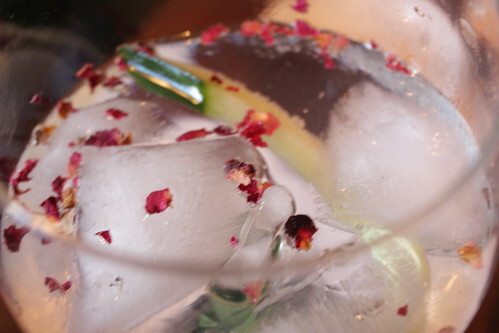 Hendrick’s with cucumber and strawberry. My favourite was the Tanqueray Rangpur, with Sicilian olive and basil, although I really liked Gilpin’s with lemon and sage too. In fact they were all delicious! Sacred gin was garnished with grapefruit and rosemary, and very tasty. We also drank Tanqueray 10 with orange and watercress, and No 3 with Sicilian olive and lime peel. The ‘Gin Jaunts’ tasting menu offers four different G & Ts served at the same time, so you can taste them alongside each other and compare. Members of the club get these for £18 – and membership is free. It’s a table service bar but the atmosphere is relaxed and friendly. They also have some tasty food options to help soak up all that alcohol. The Star seems to have become my new regular watering hole now so I’m sure I’ll get through all of their gins eventually! Something I didn’t mention in my last post is that my classmate Alex is a chef. While we were at the market he bought ten mackerel and a few squid, and we all went back to his place for a barbecue – picking up a few bottles of Chapeldown Flint Dry on the way. It was early to start drinking but we’d already been up for hours, and it was a beautiful warm sunny day. Alex busied himself in the kitchen, we drank wine in the garden outside, and soon we had a delicious lunch – I have to say it ranks up there with my favourite meals ever. 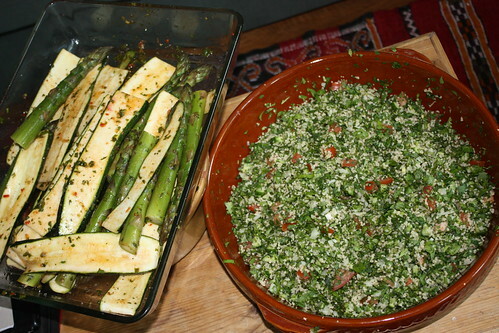 Vegetables ready to be cooked, and tabbouleh ready to be eaten. 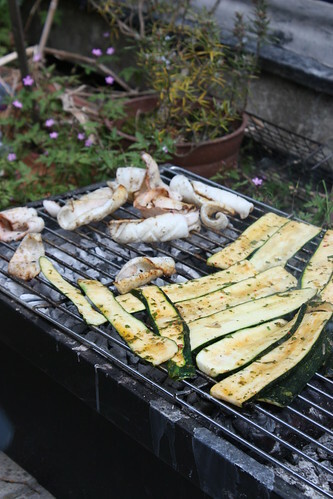 Squid and courgettes on the barbecue. 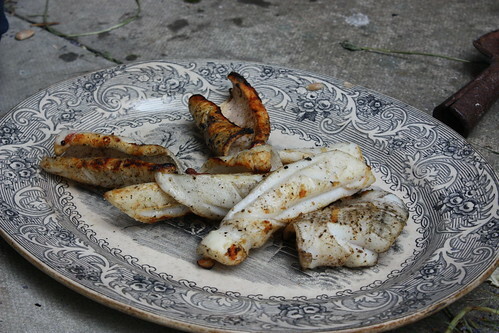 The cooked squid – delicious. 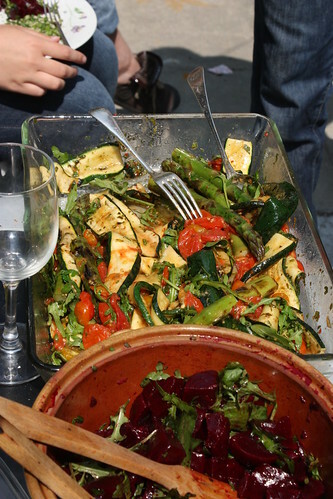 The cooked courgettes and asparagus. Can whack it all in a processor and it is easier but I like the manual way: get everything real fine and add oil till you get a good pastey consistency. Add the lemon juice last so you can taste how lemony you want it. Season to taste, adjust garlic chilli to taste although of course will be less strong once cooked. 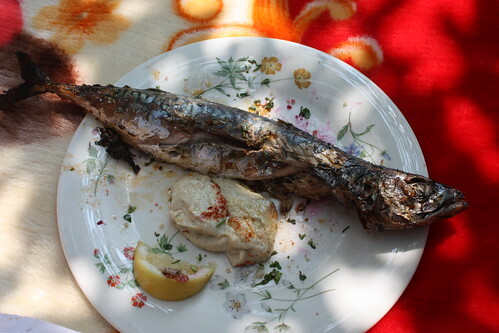 The finished mackerel, served with baba ghanoush made with an aubergine we barbecued earlier. Now I’m having a little taste memory…. mmmmm. 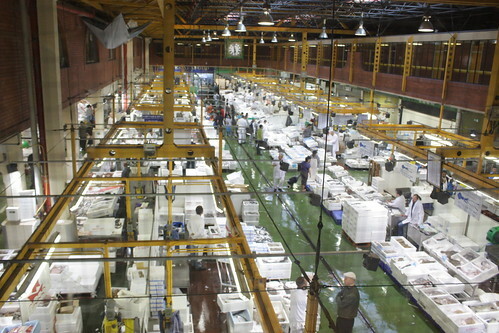 A few weeks ago some classmates and I went on a field trip to Billingsgate Market. It’s one of those London things I’ve always wanted to do. My alarm woke me at 4:45am and I shuffled off to the tube station – I didn’t even know the tube ran that early. Being summer though the dawn had already broken, it was warm outside, and made me want to get up at that time every day. I bumped into a few of my classmates at Canary Wharf and we wandered through the deserted concrete jungle to the market, in sharp juxtaposition to the high finance surrounds. 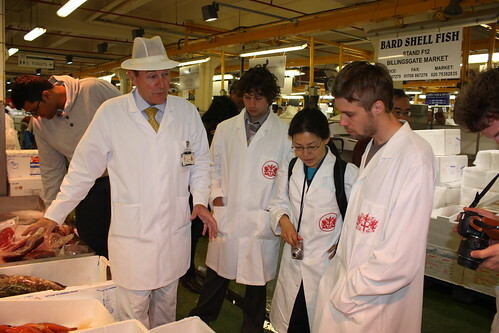 We met with the chief inspector Chris Leftwich, who told us about the history of the market and gave us the grand tour. 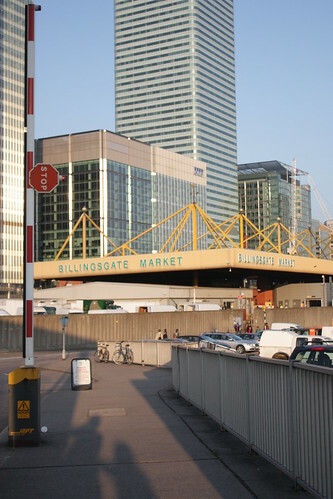 Although the market is now outside the City it is still owned by the City of London. It is an open market, meaning anyone can shop there – it’s not just a wholesale market and members of the public do shop there. The market floor. Market porters wheel heavy loads down the aisles, shouting “mind your backs” – and something ruder if you don’t move out of the way sharpish! Chief inspector Chris Leftwich showing us around the market. The inspectors have the power to remove anything from sale if it has gone off. This is a quality standard rather than a health one – fish are susceptible to different pathogens to humans so eating off fish won’t harm you, it just changes the taste and texture of the fish. This makes sense when I think of the Surströmming (rotten herring) I ate in Sweden, and other cultures around the world of eating fermented/rotten fish. Fish on display. 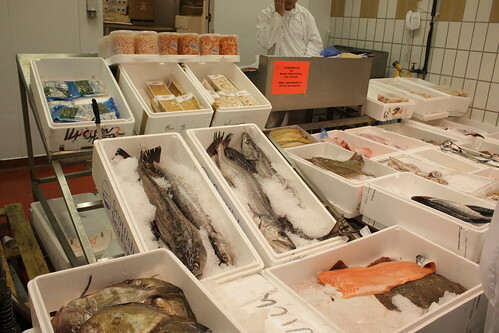 The market used to sell just whole fish but a lot of fish is sold as fillets now. Tuna is sold cut into pieces and vacuum packed – it is too expensive to sell whole. 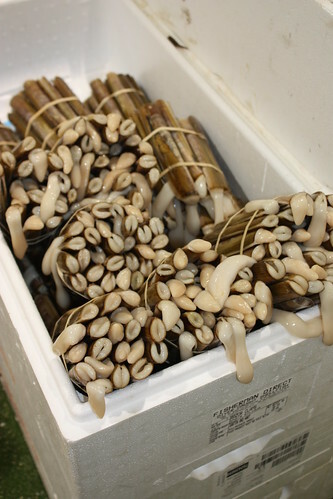 I love razor clams with their lolling tongues. 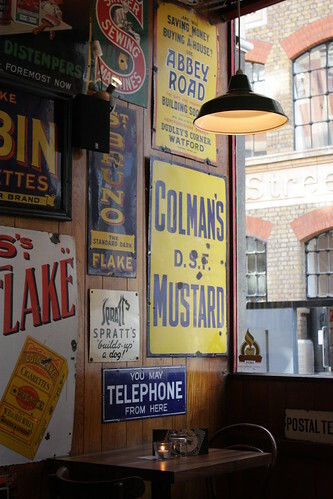 Live eels – the market used to only sell jellied eels but over the years its clientèle has evolved and so have the products on offer. A lot of products are either flown in or flown out to buyers around the world. 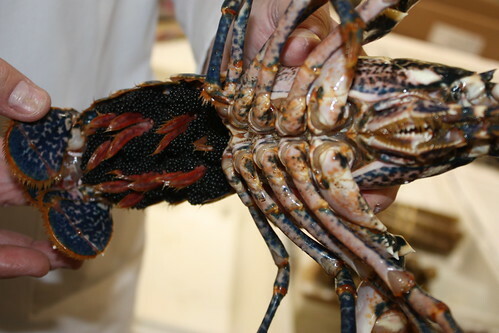 A female lobster with roe. 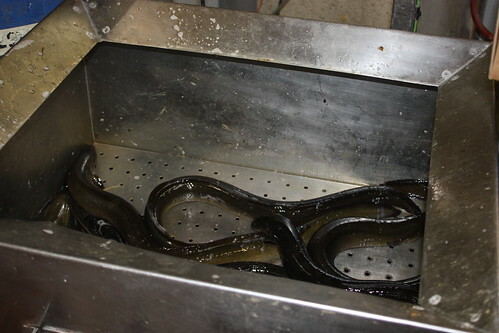 Chris said he wished the fishers would return these to the sea in order to preserve stocks. But at the moment there are no regulations requiring this. 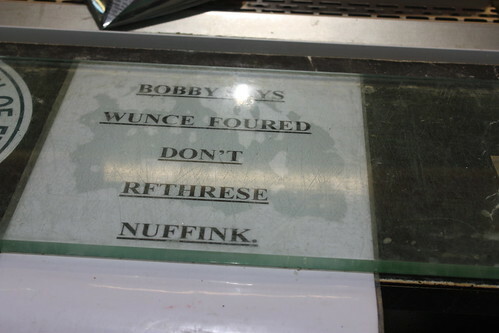 Billingsgate language – can you translate? 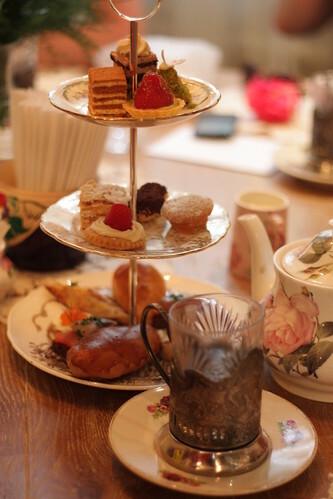 A few weeks ago I was invited to new Russian restaurant Mari Vanna for the launch of their afternoon tea menu. I love going for afternoon tea. At least, I love the concept but I’m frequently disappointed – I’m not overly into sandwiches and I often find cake too sweet for my taste, and don’t get my started on cupcakes or – horror of horrors – cake pops. So it was refreshing to have a different sort of afternoon tea at Mari Vanna. First let’s start with the tea (substandard tea being another bugbear of mine!). No worries here as it is supplied by the Rare Tea Company. 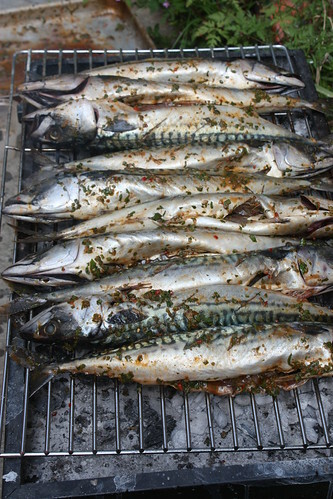 The savouries were delicious, with a lot of fish options which suited this pescetarian nicely. There was a blini with smoked salmon and cream cheese, herring on rye toast, and pirozhki, little pastries with either meat or fish. I would happily just eat the savouries, but the sweets were very tasty too. Their speciality is honey cake, a delicate spongy layered cake (top left in the picture). 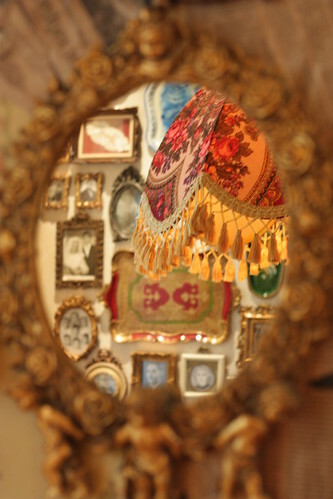 What I really loved was the ambience and decor of the place. 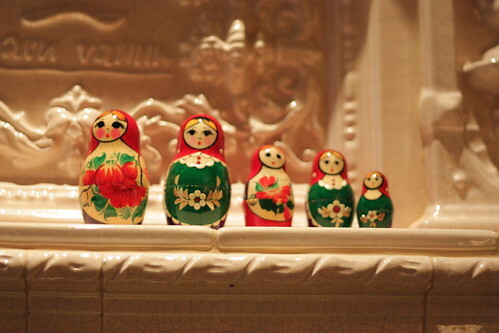 It was as if you were in your granny’s front room, if your granny happened to be a wealthy but eccentric old Russian matriarch. 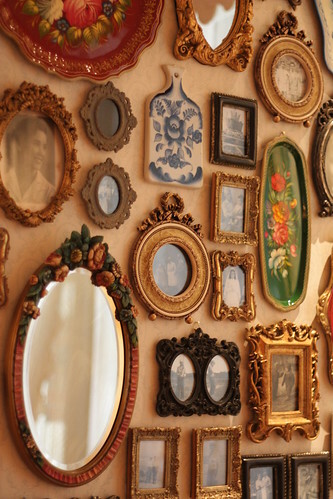 It managed to feel at once homely and decadent. Staff were very hospitable too. 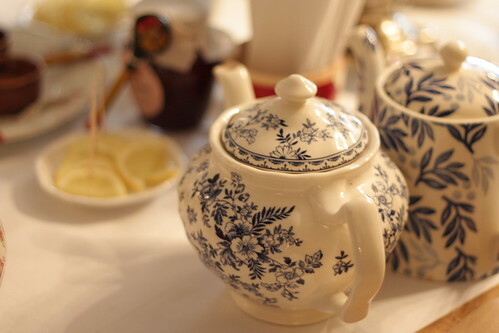 Tea with sweets and savouries comes to £35, which is a standard price for a nice London afternoon tea especially given it Knightsbridge location. Alternatively you can have tea with a selection of jams and honey for £10, which is the sort of thing I might spontaneously pop in for if the Harrods sale had gotten a bit much for me and I needed calming down… Otherwise I can see the Mari Vanna afternoon tea as perfect for a celebration or catch up with close girlfriends. If you really want to celebrate, there’s always the champagne option for an extra £10.